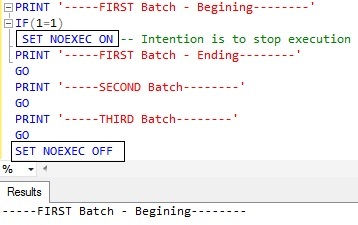 Sometime back came across a scenario where I needed to STOP or ABORT the execution of the next statements in the current batch and in the subsequent batches based on some condition. 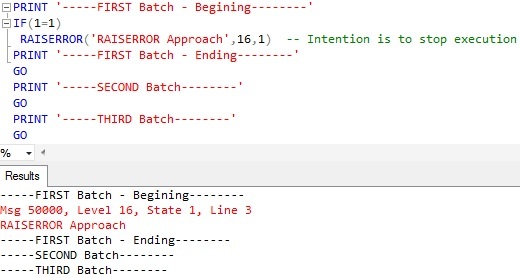 Experimented multiple approach but in most of the scenarios was able to stop the execution of the subsequent statements in the current batch, but not the statements after the go statement. Two options worked one was the RAISERROR and another was the use of the SET NOEXEC ON option. I would prefer using SET NOEXEC ON option compared to RAISERROR. This article explains the problem, failed solution approaches and the successful approaches with examples. 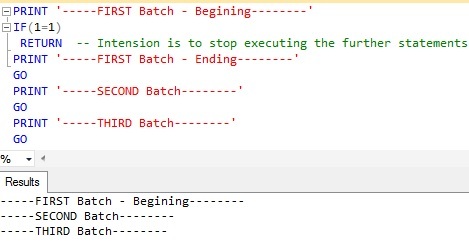 From the result it is clear that the RETURN statement was able to stop the execution of the PRINT statement in the current batch, but not able to stop the execution of the PRINT statements after the GO statement. 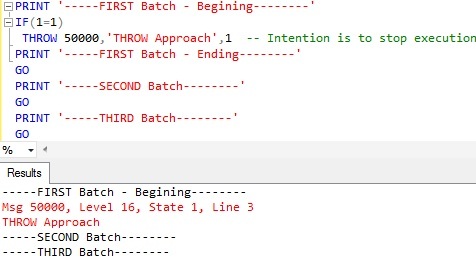 From the above examples result it is clear that neither RETURN statement nor RAISERROR statement or THROW statement are able to stop the execution of the statements in the subsequent batches separated by the GO statement. From the result it is clear that after the execution of the SET NOEXEC ON statement at line 3, further statements are not executed. 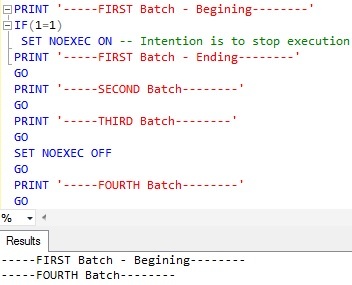 Note the statement SET NOEXEC ON causes sql server to stop executing the subsequent statement after it, but it compiles all the statements. You may be wondering at the beginning of this article I have mentioned that RAISERROR can also be used to solve this problem. But one of the examples in this article shows that even RAISERROR can’t solve this issue. RAISERROR can solve this problem if we raise an error with severity >= 20 with LOG option. But only the User with SysAdmin rights can raise error with this severity and it also terminates the connection. Because of this reason, RAISERROR is not a preferred approach for me to solve this problem. Please let me know your prefered approach for solving this problem and also correct me if my understanding is not correct. Brilliant work, and thank you very much for showing what does NOT work as well as what does. Nice article,and clear with all basic understading level..thanks.. Corrected. Thank you Martin for pointing out :). This definitely solves the problem, and one I am wrestling with. However, one small problem is that if there is code in the 2nd or 3rd batch which generates an error, it is still interpreted and so that error is still printed even though the code doesn’t actually run. You might ask why I have an might have an error in the 2nd or 3rd batch? Well, that is why I am testing for a condition early on in order to stop the script from running. I have a problem similar to what Robert is seeing, however the part of the script after the error runs. Referring to last set noexec on example , noexec works all the time everywhere. Thank you for making it so simple to understand. I came here for something else but learned something gr8.